Fortified milk with apple and oat for babies from 7 months. 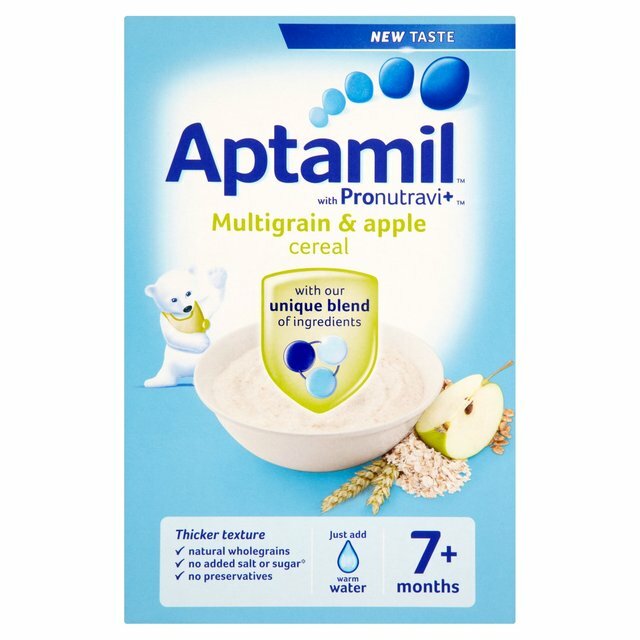 They've been pioneering research into infant and toddler nutrition for over 50 years to help you give your baby the best start in life and ensure only high quality grains and fruit are selected and then combine these with our unique blend of ingredients, Pronutravi†. GOS/FOS - unique patented blend of galacto- and fructo- oligosaccharides. Vitamins A, C and D - Vitamin D is important for normal development of bones. Cereals (33%) (Wheat (24%) (contains Gluten), Rice (6%), Oat (1%) (contains Gluten), Barley (contains Gluten), Millet, Corn, Rye, (contains Gluten)), Fortified Milk [Demineralised Whey Powder (from Milk), Skimmed Milk Powder, Vegetable Fat (Rapeseed Oil, Sunflower Oil, Palm Oil, Coconut Oil) (contains Soy Lecithin), Calcium, Vitamins (Vitamin C, Niacin, Pantothenic Acid, Vitamin E, Vitamin B1, Vitamin B6, Vitamin A, Folic Acid, Vitamin K1, Vitamin D3, Biotin, Vitamin B12), Iron, Zinc Copper, Potassium], Calcium, Apple (10%), Dietary Fibre (Galacto-Oligosaccharides (GOS) (from Milk), Fructo-Oligosaccharides (FOS)), Skimmed Milk Powder, Demineralised Whey Powder (from Milk), Prepared with 100g dry product. Per 100g powder : Energy (kJ) 1734, (kcal) 412, Fat (g) 10.5, of which saturates (g) 4.3, Carbohydrate (g) 63.8, of which sugars* (g) 39, Protein 13, Fibre (g) 5, Salt* (g) 0.2, Vitamin A (µg) 283, Vitamin D3 (µg) 6.7, Vitamin E (mg) 2.3, Vitamin K1 (µg) 8.3, Vitamin C (mg) 35.7, Thiamin (B1) (mg) 0.8., Riboflavin (B2) (mg) 0.6, Niacin (B3) (mg) 4, Pantothenic acid (mg) 2.9, Vitamin B6 (mg) 0.5, Folic acid (µg) 102, Vitamin B12 (µg) 1.1, Biotin (µg) 13, Potassium (mg) 501, Calcium (mg) 435, Iron (mg) 5 , Zinc (mg) 2.4, Copper (mg) 0.24, Iodine (µg) 110, *Contains only naturally occurring sugars and sodium, 1LRV (Labelling Reference Value) is a guide to the amount of vitamins and minerals needed per to meet the requirements of infants and young children. 2 1/2 spoonfuls of warm, previously boiled water and stir. As your baby's appetite grows use a larger spoon to make a bigger serving. This is only a guide, if you want to alter the consistency, add more or less water as required. Please store this product in a cool dry place (not in the fridge) and once opened use within 28 days. Best Before Date: See top of pack. Do not leave your baby alone whilst feeding.